The Lincoln Navigator has the reputation for luxury and celebrity for a reason--it's earned it with its style, substance, and performance. With no major changes for 2019 model year, the Lincoln Navigator continues to be the luxury sport utility vehicle to beat. Critics are awed and drivers are happy and Lincoln is winning big with the Navigator. Lincoln played the long game, slowly gobbling up competitors until the Navigator arrived at the top of its food chain. If you're looking for a luxury SUV that truly measures up to the luxury expectations of its owners, look no further. The 2019 Lincoln Navigator is the longest luxury SUV on the U.S. market. 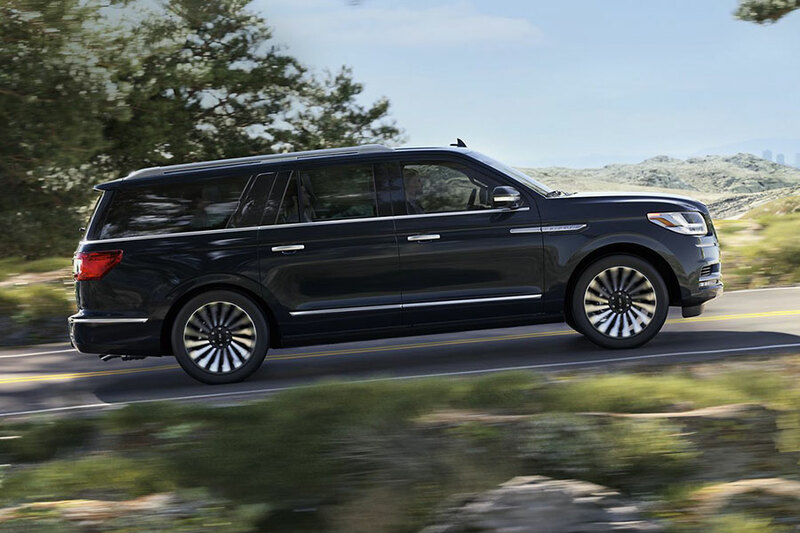 Measuring 10.8 feet, the Navigator narrowly edges out the Cadillac Escalade by 1/10th of a foot. As a result, you might never need all the cargo space the Navigator offers. This Lincoln boasts 19.3 cubic feet of cargo space behind the third row, 63.6 cubic feet with the third row folded, and 103.3 cubic feet behind the first row. Most competitors can't keep up. Take that, along with standard hands-free power liftgate and power-folding seats, and you have a convenient and useful space. But wait. There's more. Get the optional long-wheelbase body style and get an additional 15 cubic feet of cargo space! Another advantage of prodigious length is plenty of passenger room and spacious seating. Indeed, the Lincoln Navigator seat up to seven on three rows. Unlike many three-row SUVs, even third-row passengers will find plenty of head and leg room. You can drop the number of available seats to seven by getting the captain's chairs option. You might not even hear fights over riding shotgun, especially with the Lincoln's second-row infotainment controls. So you want cutting-edge technology in your luxury SUV? You got it. The Lincoln Navigator comes standard with Ford's SYNC 3 infotainment system, which comes with an enormous 10-inch touch screen, navigation, Apple CarPlay, Android Auto, Wi-Fi hot spot, 14-speaker Revel audio system, satellite radio, six USB ports, wireless charging pad, and two 12-volt sockets. Still not enough? There's also a 20-speaker Revel Ultimate audio system available. By stepping up to the coveted top-tier Black Label trim, you can get a head-up display and rear-seat entertainment system as well. The infotainment system in the Navigator is a revelation, both easy to use and quick to respond. The Lincoln Navigator boasts a wonderful engine--just one, because the one it offers makes sure to deliver. The 450-horsepower twin-turbo V6 is mated to a 10-speed automatic transmission. With an engine like that, you can feel confident while driving, even behind the wheel of something this big. There's plenty of power to move the Lincoln's 10.8 feet of metal. Acceleration is more than capable, steering is a breeze, the drivetrain is quick, and shifting is effortless and timely. As with any vehicle this length, tight turns and small parking lots will pose a challenge, but the Navigator keeps the other issues to a minimum. If you want the latest tech, all the space you could hope for, and the power to make the whole move with ease, all from inside a comfortable cabin, the 2019 Lincoln Navigator is the right choice for you.